I live rural in Minnesota and had no problems going through deep snow on unplowed roads this past winter. I love how quiet they are on the highway. Most impressive is ice-traction, stopping and getting going again. People blame tires instead of the lack of suspension maintenance but I have about 15k miles on them now and they hardly show any wear at all. I don't think I'll have any problems getting 75k-85k miles out of them. I purchased a set of Cooper Discover SRX for my 2006 Honda Ridgeline. These tires are rated for 65,000 miles however the front tires now need replacing with less than 20,000 miles on them. I had them rotated at 10,000 instead of 8,000 so voids the warranty. The tires handle well but not happy with the wear. I will not buy Cooper tires again. Just put them on my journey today, very happy boy I am, we have lots of snow and I put them to use I'll tell ya! 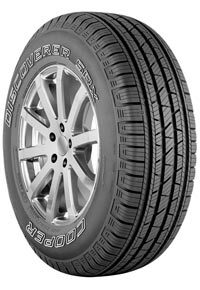 I never had Cooper tires on a vehicle, but read good reviews about this tire and decided to try them. I have only had them a couple weeks and am very pleased. I noticed a difference immediately with the handling and cornering. It rained yesterday and I drove around to see how they handled, I had fun going through some puddles, and they exceeded my expectations. I never lost traction. One of the biggest things I noticed was how quiet the tires are going down the highway. I'm not looking forward to snow, but I am looking forward to trying the tires in the snow. I'm sure I won't be disappointed if they perform as other reviews I read. Loved these tires, they were quiet on the highway and handled really well! Great tires. Drove amazing on snow. Had about 8 inches of snow and no sliding or spinning going up hills. Nice sporty looking tires. This is a great tire. I would highly recommend for SUV&s. Haven't driven in snow yet so can't comment on that aspect. Plaza Tire and Auto Service is a pillar of the community. Plaza Tire and Auto Service is a leader in offering name brand tires, wheels, auto repair and brake services for customers located in and around the Penn Valley, California area. Our goal is to focus on customer service. It is the foundation of our business. Plaza Tire and Auto Service employs a well-trained staff specializing in the sale and installation of passenger car, performance and light truck or SUV tires. Custom wheels are available at Plaza Tire and Auto Service. Special wheels and rims compliment any tire or customer vehicle. Complete under-car services, such as oil changes, brakes, shocks, struts, alignment, and transmission fluid flush for both foreign and domestic vehicles are readily available at competitive prices. Take this opportunity to browse Plaza Tire and Auto Service website or call us for personalized service. Plaza Tire and Auto Service has four locations providing quality automotive products and services to customers in Colfax, CA, Penn Valley, CA, Nevada City, CA, Grass Valley, CA, and surrounding areas. Plaza Tire and Auto Service is the leading seller in Penn Valley, CA for these tire brands Cooper, Goodyear and MICHELIN® and offers some great discounts on them. Plaza Tire and Auto Service also offers services in Tires, Auto Repairs and Wheels for the communities of Penn Valley, CA, Colfax, CA, Grass Valley, CA and Nevada City, CA. Give us a call to schedule an appointment today!